Extreame Savings Item! 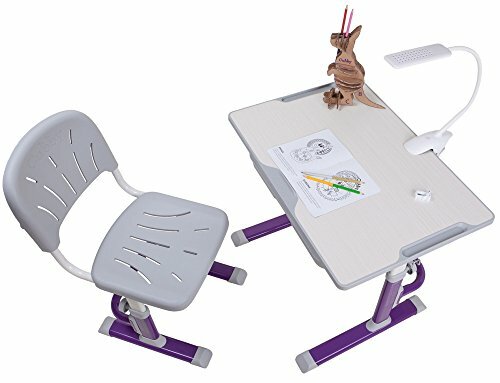 Save 45% on the FD LUPIN Height Adjustable Children Desk & Chair Set, Kids Workstation for School, Kids Study Table [CUBBY series] (PURPLE) by Fun Desk at Indsight. MPN: LUPIN. Hurry! Limited time offer. Offer valid only while supplies last. Increase the child's involvement in studying, self-education and hobbies with the help of the Fun Desk Height Adjustable Children's Desk & Chair Set! Increase the child's involvement in studying, self-education and hobbies with the help of the Fun Desk Height Adjustable Children's Desk & Chair Set! This ergonomic kids study set has been specially designed to help children have proper posture while sitting. Height adjustable desk and chair will growth with your child! The desk height can be adjusted from 20.5 inches (52 cm) to 29 inches (74 cm). The chair can be adjusted from 11.8 inches (30 cm) to 17.3 inches (44 cm). So you don't need to buy a new furniture desk set every year - your new writing desk & chair set is suitable for boys and girls from 3 to 11 years old. Fun Desk interactive work station is designed in different color variations. You can choose from blue, pink, grey and amazing purple colors. These bright color solutions provide a good from mood and working atmosphere for your children. Tilting desktop provides optimal angles for reading, writing or drawing! Anti-pinch safety design with special desk tilt stoppers prevent child's fingers from being pinched and embedded grooves holds pens and pencils during the tilt. Large drawer provides additional space and helps to store many books, papers, stationery, and other study supplies. Multi-functional steel hook helps to hold school bags. Solid stainless steel frame combined with eco-friendly and non-toxic plastic provide a premium look and incredible durability. Study table for kids is easy to assemble and you will not need outside assistance to install it. Still in doubt? All you need is to click "Add to Cart" at the top of the page and get the Premium Height Adjustable Children's Desk & Chair Set right to your doorstep in a few days! If you have any questions about this product by Fun Desk, contact us by completing and submitting the form below. If you are looking for a specif part number, please include it with your message.